4th February 2017 – 4 PACE athletes starred at the first meeting of the new and exciting Nitro Athletics series in Melbourne. 5 national teams from Australia, New Zealand, England, China and Japan plus an international select team of the Bolt All-Stars (led by captain Usain Bolt (JAM)) participated in a series of innovative new events. 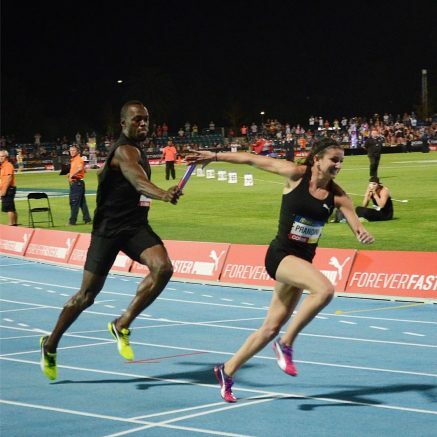 The grand finale was a mixed 4 x 100m relay which at the second change saw Usain pass the baton to Jenna Prandini (USA) and the two of them made a large contribution to the Bolt All Stars team winning the race in 40.64 seconds. Earlier Jenna had won the individual 150m in 16.99 seconds. England team captain Christine Ohuruogu (GBR) ran a leg in the mixed 2 x 300m relay and Michael Rimmer (GBR) anchored the mixed distance medley relay team. The series contains two more meetings, also in Melbourne over the next week.